This year, our Thomas Jefferson University life science event will be held on the Thomas Jefferson University campus. Although our events in Philadelphia have been successful in the past, having an on campus sponsor makes a difference in the tone of the event. Due to the convenience factor for researchers, we expect our Thomas Jefferson University life science event to draw large crowds this year. For more information about our on-campus sponsorship, please read our blog Meet Researchers at Our On-Campus Thomas Jefferson Event. Lab suppliers who have exhibited with Biotechnology Calendar, Inc. value our events because we provide a customizable experience. We offer three levels of sponsorship packages that give lab suppliers quarter-page, half-page or full-page advertisements in our event programs, seminar space, links to their company website, sponsorship ribbons and distribution rights to lanyards and event bags. Our Silver and Gold Level Sponsorship Packages also give lab suppliers access to an extended mailing list of event attendees. This list is double-checked for accuracy to save lab suppliers time when reaching out to attendees they met or may have missed at our Thomas Jefferson University life science event. For more information on sponsorship opportunities, click here. Lab suppliers working to market life science products and meet researchers in Philadelphia will find a profitable market worth investigating at Thomas Jefferson University. In 2012, the NIH awarded Thomas Jefferson University $49.7 million in research funding. In addition to receiving NIH research funding, Thomas Jefferson University received $318,984 in NSF funding in 2012. For more funding information on Thomas Jefferson University, please read our articles $2.6M in Life Science Funding Awarded to Thomas Jefferson University and $50M in Research Funding at Thomas Jefferson University. 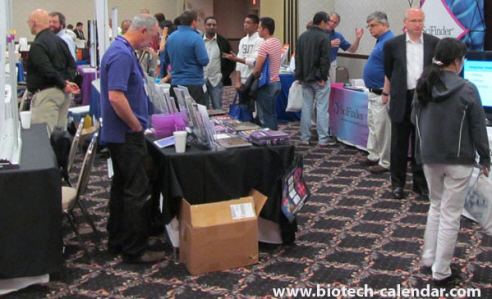 If you are a lab supplier interested in working to market life science products and meet researchers at Thomas Jefferson University, Biotechnology Calendar, Inc. invites you to attend our annual Thomas Jefferson BioResearch Product Faire™ Event on May 15th, 2014. Biotechnology Calendar, Inc. is a full-service science research marketing and events-planning company that organizes life science marketing events at top research institutions across the country. If you’re interested in working to market life science products and meet researchers at life science events closer to home, we encourage you to view our 2014 calendar of events. For more information on our Thomas Jefferson BioResearch Product Faire™ Event, or to view more funding statistics for Thomas Jefferson University, click on the button below.